GTL: Pantone's Marsala, For Your Home & A Giveaway! In case you've been hidden in a Pantone-news-free cave, last month Pantone (aka- the Big Kahuna in the world of color trends) named Marsala the color of the year for 2015. A rich earthy tone that is warm and grounding, Marsala was met with mixed feelings (as the color of the year typically is). My own initial reaction was a little under-enthused as this is not a color (I had thought) that I would typically incorporate into my own world, but upon further thought I realised that I had Marsala accents in almost every aspect of my own life. Just check out this post here for proof. Jen was way ahead of the game with her Marsala smokey eye and this All Saints number is one of my favourite dresses! Marsala is easy to incorporate into your beauty routine with nail polish, or this limited edition collection of Pantone blushes, lipsticks and eye liners, even mascara! Bling, sweaters, bags, shoes and more in Marsala are other stylish ways to work this color into your wardrobe but how, you ask, do you incorporate this color into your home? Well that my friends, is what we'll go over today, in today's Marsala inspired "Get the Look" for your home! As you can see this colour is stunning paired with blues and neutrals in chairs, sofas, or as artwork and accent pieces. Marsala is a colour commonly found in area rugs like this. Persian rugs are already big in decor right now, which is good news for fans of marsala. While these area rugs can typically seem more traditional, if contemporary is more your game, keep the walls light, add abstract artwork and use clean lines in the rest of the space for a more modern/eclectic vibe. If a persian rug isn't quite your style and you're not afraid to go bold, a sofa in marsala looks stunning. 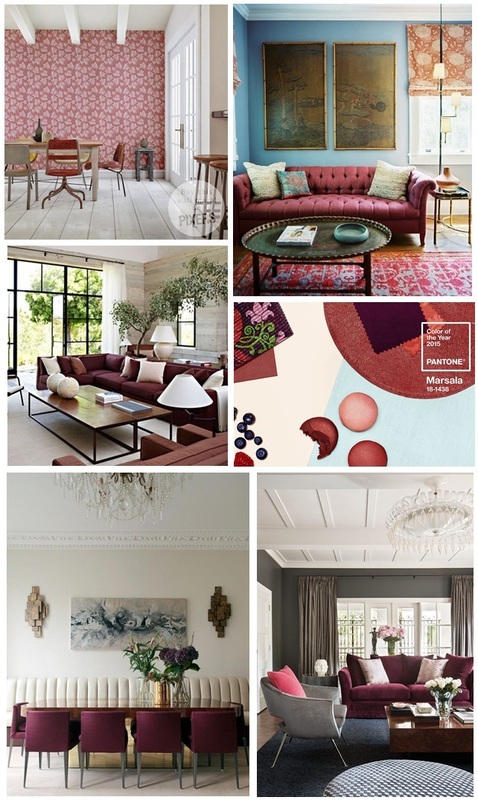 Marsala is a colour that is rich, cozy and inviting which is perfect for a sofa. Layer blankets and cushions in warm neutrals for a cozy look or graphic patterned cushions for a contemporary look. If you have blue walls or light blue accents in your home - a sofa in this colour will be beautiful as marsala and blue pair beautifully. Smaller accents such as ottomans, lamps and vintage books styled on a bookshelf are a less permanent way to incorporate a bit of marsala into your home. If you really want to embrace this year's colour, you might want to wallpaper or paint a wall (or a few!) in this stunning hue. Using this colour adds major depth to a space, warmth and a definite bold colour statement. Another less permanent way to add this color to your space is through the use of textiles. Window coverings, bedding and cushions add a pop of color as well as texture and visual interest to a room. I just adore the rich eclectic vibe of the bottom left room and the bottom right showcases again just how beautifully this color pairs with a robin's egg blue- stunning! So what do you think, will you be incorporating this color into your home? My best advice incorporating this color (or whenever you're decorating a room) is to layer your space with texture and visual interest. All of these photos show rooms with layers of textures, artwork, florals and other pieces so that the warmth of marsala isn't left on its own but rather embraced by a room that feels lived in and stylish. Let us know how you incorporate this color into your own home, or show us on IG using the #204Park! We love following the amazing things you guys are doing too! And while we're on the topic of home design and decor, from January 23-25 the Edmonton Expo Center will be hosting the all new Edmonton Renovation Show. Whether you're in the midst of a full blown home reno, just sprucing up a room or two or only looking for inspiration and ideas, these shows are a great way to get out and see what's new and exciting in the world of design and renos. And the Edmonton Renovation Show wants to give two of our lucky readers each a pair of tickets to the show to check it out themselves! Orange You Glad I Cropped My Top?